The Swedish Ambassador to Israel – Mr Robert Rydberg, hosted the ceremony that took place at the Swedish Embassy in Tel Aviv on Wednesday 6, June. Also present were the Argentinean Ambassador to Israel, Dr. Atilio Molteni, Mr Shmuel Leillen, of the Spanish Speaking Friends of the Tel Aviv University, members of Ms Bernheim’s family as well as members of the IRWF, headed by Mr Danny Rainer, of the Executive Board. 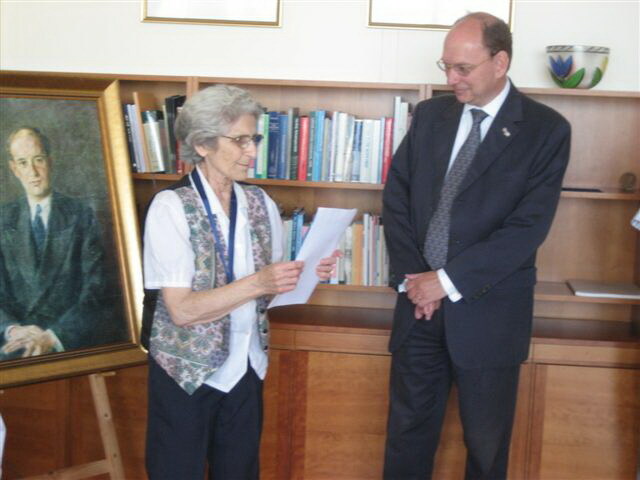 The Raoul Wallenberg award was presented to Ms Rachel Bernheim, of Kibbutz Yakoum, as a tribute to a life devoted to tell the atrocities of the Holocaust through her personal story, promoting the values of solidarity and civic courage that characterized the feats of Raoul Wallenberg and the Saviours of the Holocaust. The moving award ceremony was co-sponsored by the host, Ambassador Robert Rydberg, of Sweden and by Ambassador Atilio Molteni, of the Argentine Republic. Mr Rydberg opened the ceremony, welcoming the guest and highlighting the contribution made by Ms Barheim in her quest to divulge the story of the Holocaust. Mr Danny Rainer, Member of the Executive Board of the IRWF, pointed out that this ceremony coincided with the celebration of the National Day of Sweden, the country on which behalf, Raoul Wallenberg committed his heroic deeds during WWII. Paraphrasing an excerpt of Ms Bernheim’s book – ”Earrings in the Cellar”, in which Rachel tells us the story of her mother hiding her posessions before being taken to the concentration camp, so that ”her dear daughters, will have something to start with when you return”, Mr Rainer pointed out that very much like her mother, ”Rachel has conveyed to us the corageous story of her life, so that we, those who have been lucky to live in a free world, will have something to start with”. 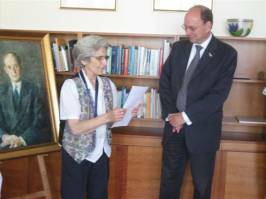 A deeply moved Ms Berman thanked the IRWF, the Swedish and Argentinean Ambassadors, for having bestowed such an honor upon her. Mr Rainer took the opportunity to salute the Swedish people on their national day and, on a personal note, to wish success to Ambassador Rydberg, who’s about to conclude his successful mission in Israel and to thank him, on behalf of the IRWF, for his warm cooperation with our Foundation.